This week's review is more of an ode to my old favorite which I no longer have. 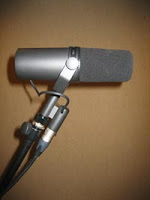 It's not the first mic people think of when they look for a great all around mic, or for a high end vocal mic. Probably because it's an affordable mic, a little ugly and semi-dorky looking. Also it's a dynamic which is less expensive. It to me was priceless though. I miss it because it was the happy medium to all my mic related issues. When a mic was too harsh on an amp or a shouting rapper or singer, the SM7 would always smooth out the ruff edges. When I sold all my other mics and that was all that was left, I was totally happy putting it to a kick drum then singing into it. That mic's honesty was my best policy. Never ever did I want what i couldn't have when she was on that stand. Why I sold it I don't know, but I want you back baby, and we will be together again. Verdict is: It's your ear.